NEW DELHI — The Indian Army killed three militants in the Kashmir region on Wednesday in an hourslong gun battle at an army base close to the highly militarized border with Pakistan. A civilian was also killed, and a soldier was wounded, the army said. 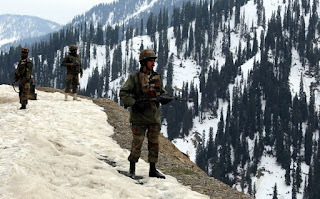 The gun battle began early Wednesday morning when militants started firing on the Tangdhar army camp from a position in the Kupwara district on the Indian side of the border, said Col. N. N. Joshi, an Indian Army spokesman in Kashmir. The bodies of the four people killed, along with AK-47s and a grenade launcher, were later recovered, but security forces were still searching the area, Colonel Joshi said. A generator and some army vehicles burst into flames during the gun battle, probably from a grenade, an army official told the news channel NDTV. The violence was the latest in a series of clashes between the army and militants in Kupwara district, which shares a disputed border with Pakistan. Four militants were killed in the district on Monday in two separate gunfights, the army said in a statement. Last week, an Indian Army colonel was killed and a lieutenant colonel was wounded in another pair of gun battles in the district. India has long accused Pakistan of training and equipping militants and sending them over the border, an accusation that Pakistan denies. Each country regularly accuses the other of cease-fire violations at the disputed border. The latest diplomatic talks scheduled between the countries were canceled this year.